After much consideration, research and justification, this baby’s now sitting in my (still unorganized) studio. 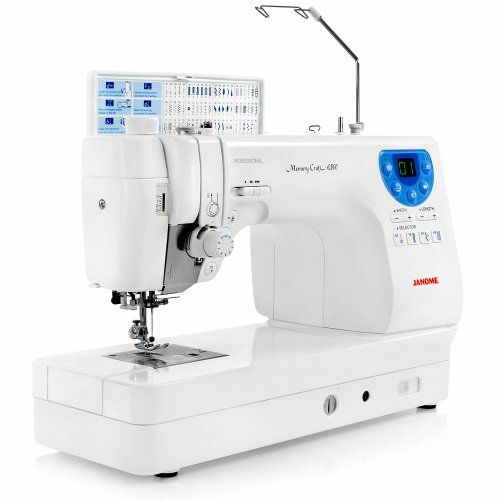 It’s the Janome 6300P Memory Craft Professional. After this past weekend’s quilt marathon, I realized it was time to invest in a professional quality machine. My Singer Confidence Quilter (only about a year old) has been acting up, making it harder and harder to use. Honestly, I think I just worked it into the ground! The 6300P is perfect for me. It has all the things I wanted, and none of the stuff I won’t use. And, it’s FAST! At $1,000, it wasn’t an easy decision to make. However, after just one evening of sewing, I don’t think I’ll be regretting it. Besides, I think this sewing thing is going to last for me – it’s not a phase. Look for a more complete review once I’ve put her through her paces. And, she needs a name. Anyone out there have this machine? Please let me know what you think.